Sound (4.7/10) – While the tuning of the AH-C360 is very indicative of their consumer-oriented nature, the somewhat v-shaped overall balance does stay true to the signature of the flagship AH-C710. The bass of the AH-C360 is big and somewhat bloated, though not quite as offensive as that of the Sennheiser CX300. Bass impact is fairly good and the low end is quite tactile and well-extended. Speed, texture, and detail, however, are all somewhat lacking, as one might expect from a budget-level earphone with this much bass. ‘Tight’ simply isn’t a word I would use to describe the low end of the C360. The midrange is slightly warm and tends to be overshadowed by the bass. The upper midrange, while clear of bass bleed, is noticeably recessed. The resulting sound is slightly dull and lacks the fullness of sets such as the Meelec M21 and Brainwavz M1. Detail and clarity are, on the whole, decent but don’t break any barriers in the price tier. The similarly-priced Klipsch S3, despite similarly enhanced bass, has noticeably cleaner and crisper sound. Even the cheaper H2O Audio Flex walks all over the C360 when it comes to clarity and articulation. The treble of the AH-C360 is hyped up in an attempt to balance out the sound signature. It does not, however, as the earphones still sound slightly dark on the whole. The top end of the AH-C360, instead of being laid-back and smooth as it is with most other budget bass monsters, is quite prominent at times and definitely runs the risk of listening fatigue for those sensitive to it. Surprisingly, the treble emphasis of the C360 manages to add edginess to the top end without any sparkle or air. Indeed, the entire sound is slightly stuffy despite the average-sized soundstage and decent imaging. If not for the strained and bloated bass, the AH-C360 could be a very good entry-level earphone, but it simply doesn’t offer enough refinement over other mainstream offerings to stand out from the crowd. 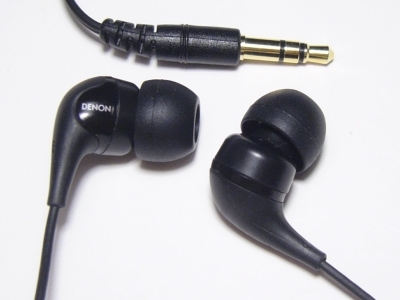 Value (6/10) – The Denon AH-C360 is one of the many bass-heavy entry-level earphones offered by mainstream manufacturers. While it is less bloated than the ever-popular Sennheiser CX300 and Skullcandy TiTans, the overall sound quality of the C360 is really nothing to write home about. Neither are the isolation or build quality – both are merely adequate – and, while the angled-nozzle housings are extremely comfortable, the modular cable and low y-split may annoy some users. Further price cuts may bring the AH-C360 down into ‘must buy’ territory but as it stands, Denon’s budget model really doesn’t have a leg up on the competition.